Chuck’s legal assistant for over 30 years, Donna Burger, recently celebrated being a 6 year breast cancer survivor. Donna was unable to participate in the recent local Komen Race for the Cure, as she was working during the event. 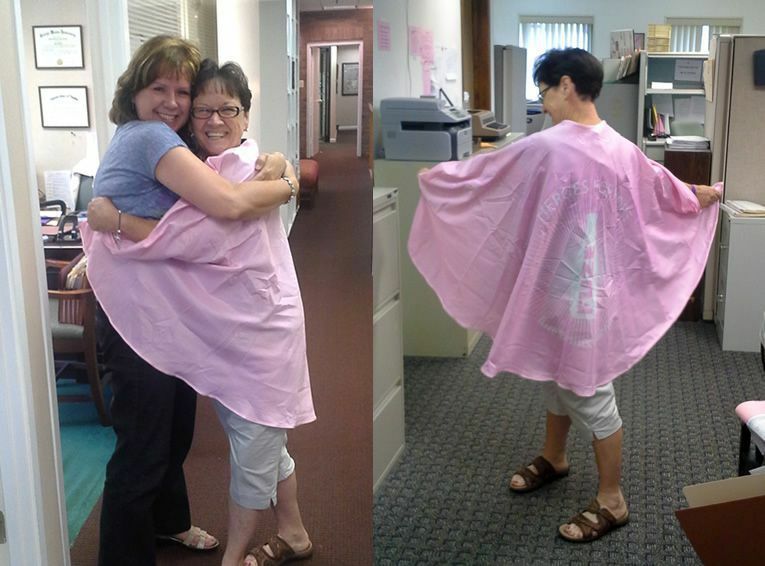 She was so sad to not be able to be part of it, so a friend brought Donna this pink cape that says “Heroes for Hope” and told her she is a “super woman!” Here Donna and Claire celebrate her special anniversary, one of joy, courage, and hope. Donna and Claire Keena share a hug. Claire is not only a coworker and friend for 25 years, but more importantly, she was a huge part of Donna's surgery and recovery from breast cancer.